Many of these books can be bought online from the little VW club in Corvallis,OR. Go ahead and help these folks out. History, specs., performance, production info. 80 pgs, 60 b&w, 60 color ills. A collection of original German advertisements. Text in German. 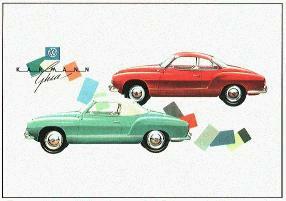 Covers all VW's from 1949 to 1961. 120 pgs, 104 color ill. Detailed model by model descriptions. 176 pgs, 142 b&w ill.